Biased Signaling in Physiology, Pharmacology and Therapeutics is a unique and essential reference for the scientific community concerning how conformational-dependent activation is a common phenomenon across many classes of receptors or signaling molecules. It discusses the role of conformational dynamics in leading to signaling bias across different classes of receptors and signaling molecules. By providing a broader view of signaling bias, this resource helps to explain common mechanisms shared across receptor classes and how this can be utilized to elucidate their cellular activity and better understand their therapeutic potential. 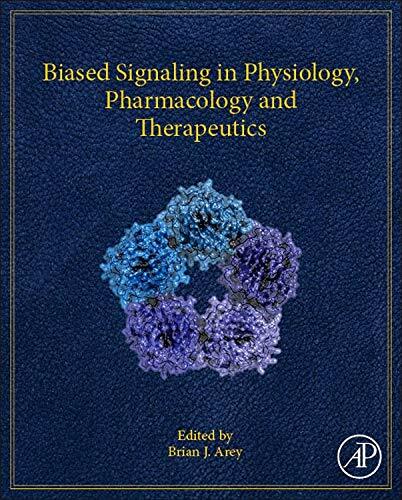 Written for both new and established scientists in pharmacology, cell biology, biochemistry, and signal transduction, as well as physicians, this book clearly illustrates how biased receptor signaling can be utilized to develop and understand complex pharmacology. Chapters are each focused on a specific class of receptor or other important topic and make use of real-world examples illustrating how the latest research in signal transduction has led to a better understanding of pharmacology and cell biology. This structure creates a basis for understanding that physiological signalling bias has been selected by nature in order to provide complex and tissue- specific biological responses in the face of limited receptors and signaling pathways. This book provides a framework to reveal that these physiological mechanisms are not restricted to one receptor type or family and thus presents receptor signaling from a newer, more global perspective. Dr. Brian Arey received his bachelor’s degree in biology from St. Louis University where as an undergraduate he performed research on estrogen and progesterone receptors and their interactions with chromatin. Brian then moved to Florida State University where he received both Master’s and Doctorate degrees studying neuroendocrine physiology with Dr. Marc Freeman. His theses described the discovery of a novel underlying circadian rhythm of neurotransmitters regulating pituitary prolactin secretion. Pharmacological and unique physiological experiments led to the identification of the key neurotransmitters systems involved thus providing a working model of the neurotransmitter reflex. This work ultimately became the foundation for understanding regulation of prolactin secretion in rats. At this time, Dr. Arey also collaborated with fellow students in understanding the biphasic signaling of dopamine to regulate prolactin secretion in vivo. In 1992, his work in graduate school led to an NIH Postdoctoral Fellowship in the NIH Center for Reproductive Sciences at Northwestern University, where he studied the expression and signaling mechanisms of the mouse and rat prolactin receptors. He then joined the Women’s Health Research Institute at Wyeth-Ayerst Research as an independent investigator. While at Wyeth in the mid-90’s, Dr. Arey collaborated to develop some of the first described allosteric agonists, antagonists and partial agonists to the follicle-stimulating hormone receptor. As part of this research he was the first to demonstrate that the FSH receptor could activate multiple G-protein signaling pathways. In addition, he proposed the concepts of biased agonism/conformational dynamics as a natural physiological phenomenon in relation to glycoprotein hormone receptors in a seminal paper that revealed that naturally occurring glycosylated isoforms of FSH behave as biased agonists. In doing so, Arey and Lopez helped to clarify the physiological role of glycosylated variants of glycoprotein hormones and demonstrated that synthetic compounds could be designed to mimic the activities of the natural FSH isoforms. Dr. Arey ultimately moved to Bristol-Myers Squibb where he and his colleagues developed allosteric modulators to a number of other receptors including novel allosteric modulators to the CaSR. In another important observation, Dr. Arey hypothesized the importance of an allosteric site in GPCRs that existed in a pocket (P2 pocket) formed by transmembrane domains I, II, III and VII. Dr. Arey and Dr. Stephen Yanofski showed through the creation of chimeric receptors that this pocket was important to the mechanism of FSH allosteric compounds. He and others also demonstrated through molecular modeling that this pocket was also important for new allosteric modulators of the CaSR.Throughout his tenure in pharmaceutical research, he has contributed to the discovery and development of multiple marketed medicines. Dr. Arey has written numerous reviews and is requested to speak internationally on the topics of allosteric activation of GPCRs and the role of glycosylation in regulating function of protein ligands. Most recently, Dr. Arey has utilized biased signaling to develop novel ligands to several orphan GPCRs as a basis for exploiting these novel targets for the development of innovative therapies.